Raven Camoran is an Altmer Mythic Dawn Assassin located in the Imperial City Sewers. He is the "Sponsor" for initiation into the Mythic Dawn, carries the only copy of the Mythic Dawn Commentaries, Vol. 4 available to the player, and holds the Sunken Sewers Key for access to the North Section of the Sunken Sewers. He is also the son of Mankar Camoran, and you encounter him together with his sister Ruma in his father's Paradise. When you first encounter him in the Path of Dawn quest in the Imperial City Sewers, he will greet you with this speech: "So. You want to become one of the Chosen of Mehrunes Dagon. The Path is difficult, but the rewards are great. I have the book you seek. With it and the Master's three other books, you will possess the key to enlightenment. But do you have the wit and strength to use the key you have been given? If so, I will see you next at Dagon's Shrine. Yes, I think you may..." He will trail off, and from here there are two possibilities for his dialogue, depending on whether it is Baurus or you who decides to meet with Raven. If it is the former, he will address Baurus with, "Wait! I've seen you before! You're the Blade that Brother Astav was trailing! Brothers, kill this pretender." However, if you do not let him finish his speech (by rushing out from your hiding place before he is finished) he will stop his speech and say, "I told you to come alone! Brothers, kill them!" Battle will commence after this. If you meet with Raven and decide to interrupt him, the same line is used as Baurus attacks after Raven's initial dialogue cancels. Lastly, if you allow Raven to finish all dialogue, Baurus will simply rush out and Raven will exclaim orders to attack. As a side note, if you refuse to sit down, he will use the following warnings: "Take a seat. ", "Sit down. Now. My patience is not unlimited." and finally, "I'm afraid you have failed the first test. There are no second chances in Lord Dagon's service." He will then proceed to attack you. In Paradise, Raven will give a brief dialogue similar in content to his sister's. Once you speak to him, he will say, "So here you are at last. The lackey of the Septim pretender. You still think you have a chance, don't you? We knew you would find your way here eventually. But it is of no consequence. You should not keep my father waiting any longer. He expected you hours ago. Come, you came to see him, did you not?" He will end the conversation after this. If you attempt to speak with him again, he will simply say, "I have nothing else to say to you. But my father wants to speak with you before we send you on your way." The dialogue will close once again. Raven has two refid parameters because he exists twice at the start of the game. The first parameter refers to his incarnation in the Elven Garden Sewers; the second to his appearance in Paradise. He wears a Mythic Dawn robe, his magical ring, and a pair of gold trimmed shoes. He carries some combat potions and scrolls, Mythic Dawn Commentaries 4, the key to the sewers and a large amount of gold. Raven has only a few spells: a "Mythic Dawn Barrier Spell," a leveled Shield spell, a "Mythic Dawn Range Spell," a leveled Shock spell, in addition to the standard (though slightly modified; see notes below) Mythic Dawn Armor and Weapon spell. He also has a personal birthsign which gives him permanent fortify magicka and reflect damage effects. 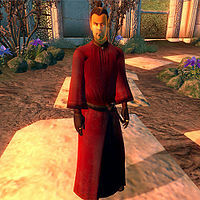 Raven Camoran's name is mentioned during the Thieves Guild quest Untaxing the Poor: his name appears on the Waterfront Tax Records that you retrieve during the quest, although it is not possible to find him at said location. Raven is one of the few Mythic Dawn agents in the game to use the Mythic Dawn bound armor and sword spell, the only other being Else God-Hater. All other agents will use the bound armor and mace spell instead.